Cast performing "Take Me to Heaven"
Many musicals contain broad societal themes or historical events as the backdrop for the production. Sister Act is not one of them. Instead, the musical takes the audience on a jolly, at times silly, feel-good journey that demonstrates how people can change for the better if given the right environment and support. 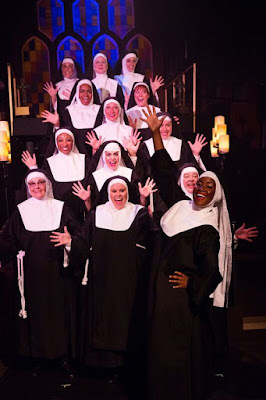 With music by Alan Menken and lyrics by Glenn Slater and a book by Bill and Cheri Steinkellner, Sister Act is based on the successful 1992 movie of the same name that starred Whoopi Goldberg. The musical production opened in 2009 and received five Tony Award nominations in 2011. Under the meticulous direction of Lawrence B. Munsey (who also teamed with Mary Quinn for the glorious costumes); solid musical direction of Ross Scott Rawlings; imaginative and clever choreography of Helen Hayes Award winner Mark Minnick; and a high-energy, talented company, Sister Act, currently playing at Toby’s The Dinner Theatre of Columbia, serves up a tasty production that is matched only by its scrumptious buffet. 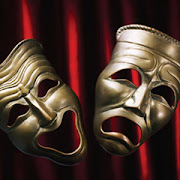 There is an abundance of comedy that will keep you laughing heartily. The up-tempo songs are toe-tapping with some powerfully delivered ballads in the mix. The influence of disco, Philly soul and gospel is evident in Mr. Menken’s score. A few of the songs are of the show-stopping variety and are performed exceptionally by skilled vocalists. Mr. Rawlings’ six-piece orchestra is well-balanced in support of the performers without overpowering them. Set in 1977 Philadelphia, the Whoopi Goldberg in this production is Ashley Johnson as Deloris Van Cartier, an aspiring disco diva who ends up in hiding at a convent when her married club-owning gangster boyfriend, Curtis Jackson (DeCarlo Raspberry) and three buffoon-like accomplices Joey, Pablo and TJ (talented Russell Sunday, Moses Bernal and Tobias Young, respectively) find out she’s squealed to the cops about his murdering one of his cronies. And the quest for Curtis to find her is on. 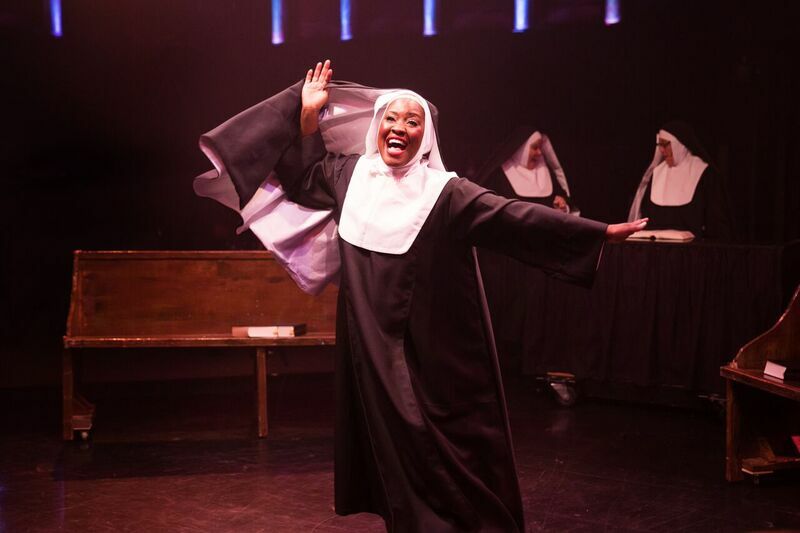 At the convent, Deloris meets up with the rigid, no-nonsense Mother Superior (Lynn Sharp-Spears) where their backgrounds, personalities and religious values clash but mostly in a light manner laced with sarcasm. Deloris brings to the convent her streetwise persona, plenty of sass, and an irreverent view of religion and is frustrated by the convent’s restricting rules. Deloris also finds the meaning of true friendship as she engages with the other sisters. From them Deloris ultimately finds a higher purpose to her life and that they are not much different from her. Without question, Ms. Johnson (Memphis, The Wiz, The Color Purple) as Deloris turns in a star-quality performance. She offers the right amount of sass in her dialogue, showcases her comedic skills with spot-on timing and body language, and Lord, can she sing! The romantic interest is “Sweaty Eddie” Souther, played by Hasani Allen, a dorky, klutzy (sometimes a bit too much) policeman whom she knew in high school. Eddie is assigned to protecting her from Curtis. His big number “I Could Be that Guy” is strong and emotional and well-delivered. That number is enhanced by a wonderful double-breakaway costume. Ashley Johnson singing "Raise Your Voice"
As the deadpan Mother Superior, Ms. Sharp-Spears is the perfect foil for Deloris. Their repartee provides many of the laughs in the show with each feeding off each other proficiently. “Here Within These Walls” and “I Haven’t Got a Prayer” ably showcase Ms. Sharp-Spears’ solid soprano voice. Mr. Raspberry as the show’s antagonist Curtis shines in “When I Find My Baby” aided by his three aforementioned cohorts. He repeats that number in the second act as a solo very movingly demonstrating his rich baritone vocals. A young apostolate in the convent, Sister Mary Robert played tenderly by Teresa Danskey, takes the leap from being shy to confident thanks to her bonding with Deloris. Her soaring performance of “The Life I Never Led” that depicts this discovery is one of the production’s highlights. Other notable performers include the comedic Robert Biedermann 125 as Monsignor O’Hara, Jeffrey Shankle as Ernie, Amy Haynes as Sister Mary Patrick, Lynne Sigler as Sister Mary Lazarus, and the always enjoyable Jane C. Boyle as Sister Mary Martin-of-Tours. Rounding out the company are Mary Kate Brouillet, Coby Kay Callahan, Erica Clare, Andre Hinds, David Jennings, Rachel Kemp, Santina Maiolatesi, Darren McDonnell, and Elizabeth Rayca. The swings are Tina DeSimone and A.J. Whittenberger. David Hopkins’ set and lighting design works well in Toby’s in-the-round theater. There are a fair amount of scene changes from bars to the convent utilizing a variety of moveable props. The staging for the scene changes is smooth and seamless. The best set is the depiction of the church’s chapel complete with stained glass windows along the walls of the theater as well as candles and candle chandeliers. Sister Act is an enjoyable, uplifting musical that, praise the Lord, will surely entertain you. Don’t miss it. Running Time: Two hours and 40 minutes with an intermission. Sister Act at Toby’s The Dinner Theatre of Columbia runs through November 13. For tickets and information, call 410-730-8311 or visit online.